Since the term Green Radio was first coined by Mobile VCE's Visions Group in early 2007, it has become widely used in the industry. The goal of this research is to secure 100x reduction in energy requirements for delivery of high data rate services, thereby reducing CO2 emissions and Opex costs whilst enabling new services. It is investigating both architectural and individual technological approaches. Climate change and the need to reduce global energy usage are now accepted. Today 4bn people on the earth have access to a mobile phone; effective access to information and communications is a proven stimulus to economic development. Recent studies have shown the potential for IT to reduce energy consumption in other industries. As a key enabler of green solutions, on environmental and economic grounds, more energy efficient radio access networks are required. 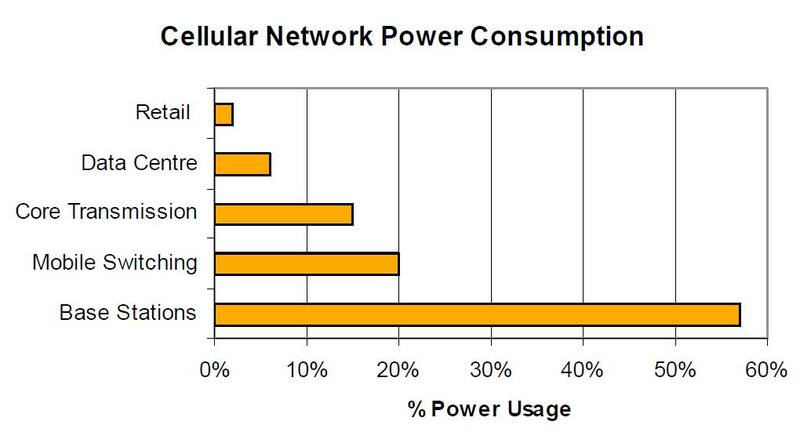 A typical mobile phone network in the UK may consume approximately 40MW, excluding the power consumed by the users’ handsets. From an operator perspective, reduced energy consumption translates directly to lower operating expenditure, OPEX. The need for reduced carbon emissions and OPEX costs for wireless networks are the two key drivers of Mobile VCE’s Green Radio programme. The Green Radio programme sets the ambitious goal of achieving a 100-fold reduction in power consumption over current wireless communication networks. This must be achieved without compromising (and preferably enhancing) the Quality of Service (QoS) for the user and without negative impacts to the deployment costs for network operators, equipment manufacturers, content providers, etc. The overarching goal of 100-fold reduction in energy use will be addressed by identifying the optimum network architectures for low overall energy use, and by developing techniques to minimise the power requirements of wireless communications. Alternatives to the existing network architecture offer the potential to reduce energy and power consumption. Moving the access network closer to the user enables a reduction in the transmit power required. This is achieved at the expense of increased backhaul requirements. Key issues for consideration are base station cell sizes, backhaul method (including wireless, fibre and free space optical), and potential use of enterprise and femto-cell technologies. The optimum tradeoff will minimise overall energy use, bearing in mind the embodied energy needed for equipment deployment. Multihop and mesh network architectures also have potential to reduce energy use while maintaining QoS, especially where there is opportunity for delay-tolerant data to be carried using low power. An increased density of access devices will also require effective utilisation of spectrum in order to ensure that the overall interference temperature is not degraded. Techniques may be employed either to reduce the radiated power required to achieve the required QoS or to achieve the required radiated output power using less overall input power (noting that the overall power consumption of a device is always greater than the radiated power). Effective Radio Resource Management and Signal Processing may reduce the radiated power requirement to maintain the required QoS. Control of interference is key to energy efficiency. A given data throughput implies a required ratio of signal to interference level at the receiver. If interference is reduced, the transmitted power level can also be reduced while maintaining performance. Power efficient hardware implementation of base station equipment can also facilitate a reduction in total energy consumed relative to the radiated power. The equipment architecture and radio design technology will be developed so as to provide efficient operation at high power and also at times of lower traffic demand.